For those who still haven’t been tempted by the recent string of console price drops, Walmart is offering a deal that is about as good as you’re going to get. 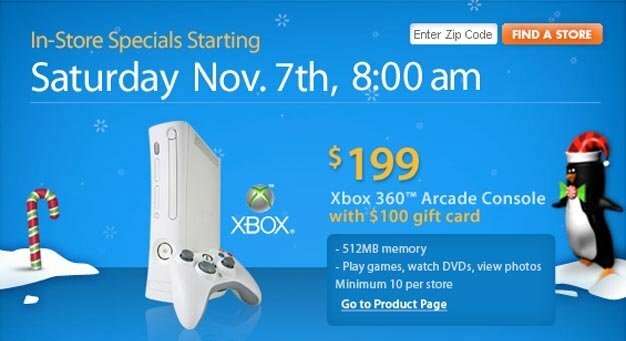 For one day only, this Saturday, Nov. 7th, the giant retailer is offering the Xbox 360 Arcade Console for $199 with a $100 gift card, making the system essentially $99. Supplies are sure to be limited and as always it’s first come first serve, so gamers might want to change their normal weekend sleep-till-noon schedule and head to the store early to snag a system. Even though the Arcade unit lacks a hard drive, that $100 gift card isn’t going to spend itself. Too bad the only option for storage devices are Microsoft brands so you won’t be seeing much in savings with that.